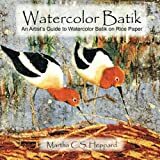 "Watercolor Batik: An Artist's Guide to Watercolor Batik on Rice Paper, by award winning artist Martha Heppard is the first book published worldwide devoted entirely to watercolor batik known to exist. She takes an artist through the history of batik and introduces them to the batik technique for watercolor on rice paper in a very clear and concise manner. She includes four demonstrations with step by step instructions. This book is written for the beginning artist as well as the more advanced painter looking to enhance their skills and take their watercolor to a new level. Martha's paintings are extraordinary because of how she uses multiple layers of paint to build up rich strong colors. The realm of batik is expanded by this book, for the technique of watercolor batik is similar but yet different from that of textile batik (and there is a different aesthetic experience in looking at the two). This book has 50 photos in 84 pages, allowing the reader to visualize, as well as read about, the process of watercolor batik on rice paper."